In a little workshop in Los Angeles, Calif., sits a man who for your amusement distorts normal looking movie actors and actresses into freaks. 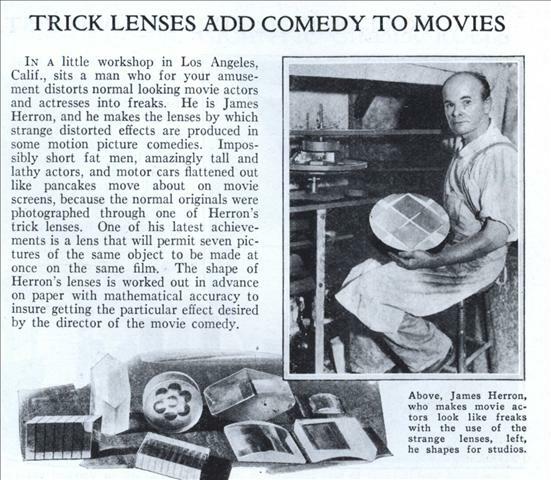 He is James Herron, and he makes the lenses by which strange distorted effects are produced in some motion picture comedies. Impossibly short fat men, amazingly tall and lathy actors, and motor cars flattened out like pancakes move about on movie screens, because the normal originals were photographed through one of Herron’s trick lenses. 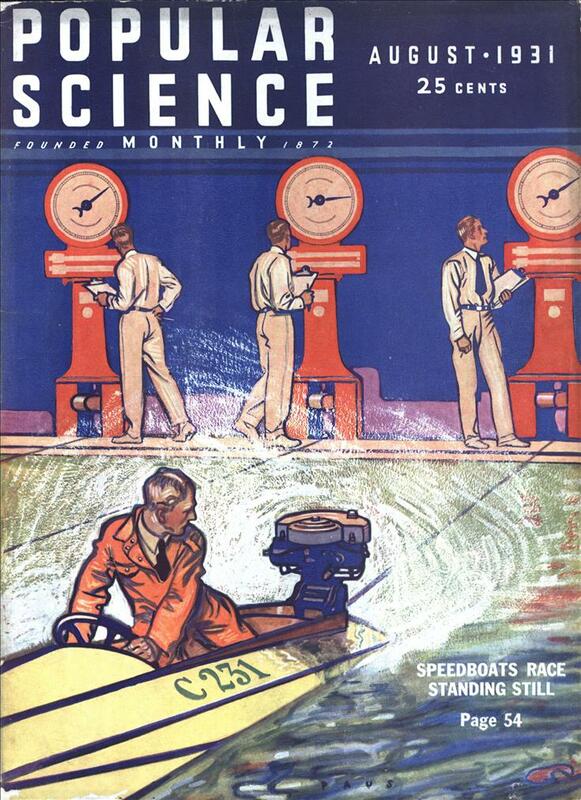 One of his latest achievements is a lens that will permit seven pictures of the same object to be made at once on the same film. The shape of Herron’s lenses is worked out in advance on paper with mathematical accuracy to insure getting the particular effect desired by the director of the movie comedy. These are anamorphic lenses, and had more uses than trickery. Widescreen pictures depended on them. They allow the 4:3 rectangle of a 35mm negative to photograph a scene with much wider proportions, such as 16:9 or even 9:4. A widescreen film is then projected through a similar lens to spread the 4:3 image so that it fills the differently proportioned screen in the cinema. If you look at the infamous “Turkish Star Wars” available (for instance) on YouTube, they used original footage from a print of the film, but projected it through a regular lens instead of the anamorphic lens needed to give it the correct proportions. The result was that the Death Star was half the width it ought to be, and came across more as a Death Egg.